Well, National Bike Month is over. Thanks to everyone who participated in our bicycling challenge. Grand Total for the Month of May: 2,466 miles! That’s considerably more than last year. Way to go everyone! On May 28, a team of 20 volunteers evaluated over 120 intersections, 360 crossings and a majority of sidewalks in Hightstown. The team was supported by DowntownHightstown.org, the Hightstown Parks and Recreation Department and Mayor Bob Patten. The team mapped all of the crossings before the event. Volunteers have since helped to enter all of the data from the assessment and are in the process of naming many hundreds of photos, each of which represents a needed improvement. This data is the foundation for two objectives: 1) an online walkability map of pedestrian-friendly routes and gaps in infrastructure and 2) a prioritized list of needed improvements. 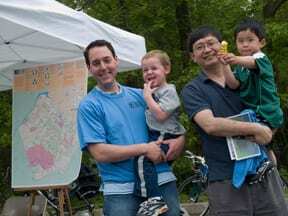 The goal is to encourage people to walk more and advocate for a more walkable community. Yesterday was fun at our table at the West Windsor Community Farmers’ Market for opening day. We set up and staffed our WWBPA table and had lots of people stop by to talk, share ideas, pick up a copy of our spring newsletter, and picked up 4 new memberships! We’ll be back at the market in 2 weeks, and every other Saturday morning, here’s the season schedule: May 30, June 13 (with the Pedals for Progress Bike Drive), & 27, July 11 & 25, August 8 & 22, and September 12 & 26.